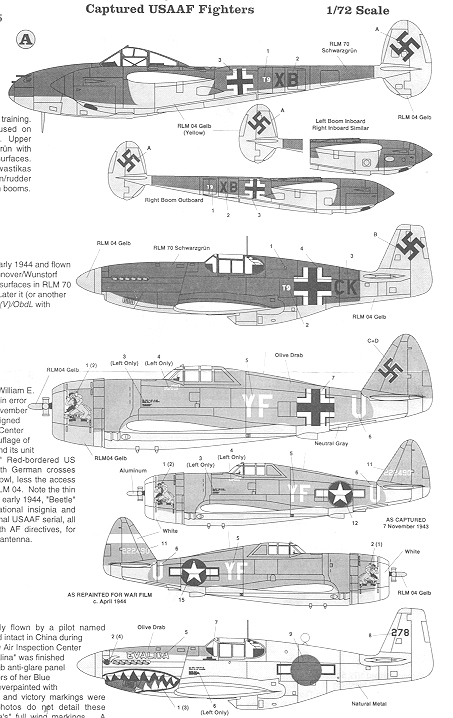 Here is an interesting sheet of US aircraft captured by the Germans and Japanese. The Germans used these planes to help train fighter and bomber crews in not only identifying the planes, but also by allowing some fighter pilots to fly them so they could see how the planes behaved and to find any weaknesses in them. This actually proved to be quite useful, unfortunately, by the time most of these had done the rounds, the number of skilled Luftwaffe pilots able to take advantage of these traits was few. There are schemes for four planes on the sheet. First off is a P-38G that was supposedly used on clandestine recce missions. It was repainted in RLM 70 uppers with RLM 04 yellow undersides and tails. Next is a P-51B, painted in a similar manner to the P-38 shown above. The third aircraft is a P-47D. This plane is shown in several markings. It was never repainted in German colors, though the nose was painted yellow and the US insignia was over-painted and replaced by German. An addendum drawing shows that this plane also had a yellow rudder. The sheet also offers its US markings it wore when shot down. It can also be built in slightly different markings as used in a German movie. Finally, a P-51C as captured by the Japanese from the 23rd FG in 1944. 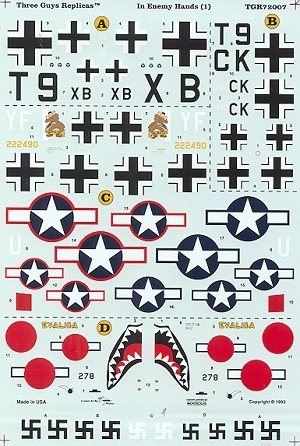 Apparently the Japanese merely over-painted the US Insignia with Japanese roundels, though you are given additional decals as research has not been able to determine the wing markings. Really, a pretty neat sheet covering some interesting aircraft.